I’m no cook. If it’s not on Chipotle’s menu, I’m not eating it. And yet, I feel like I understand certain things that don’t go together, say Captain Crunch cereal and goat cheese, meatball subs and tuna, ice cream and hair. That’s kind of the experience to be had when watching Kin. Advertised as an adolescent SciFi adventure where a ‘tween finds an intergalactic gun and all his problems are solved (nothing tone deaf about that storyline), the film is much more than that. And also much less. Eli Solinski (Myles Truitt) is an adolescent outsider, missing his mom and trudging through his dad’s chores and disappointment. 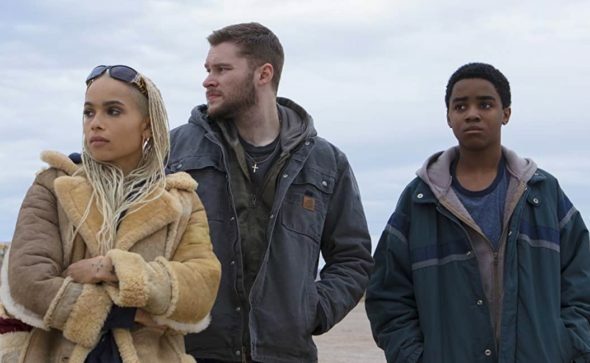 His older brother Jimmy (Jack Reynor, or as I like to call him, Handsome Seth Rogan) comes home from a 6-year prison stretch, and things go quickly to hell in a handbasket thanks to his old associate, Taylor (James Franco). Filmmaking brothers Jonathan and Josh Baker start off with traditional angsty teen drama. They quickly warp it into a gritty, mid-budget crime thriller, with a little charm thanks to Franco’s characteristic weirdness: badly cut mullet, unexplained puffy coat, women’s shoes. But then it turns into a road picture with antics and a sort of tragic take on the cycle of poverty, crime and bad decisions. By this time, we realize that Truitt doesn’t have much hope of establishing a character, as he may, indeed, have no idea what film he’s in. Reynor fairs slightly better. He’s likable and vulnerable. To pull the role off, he’d also have to be believably corrupted, which is where Reynor falters. Zoe Kravitz is Milly, the stripper they befriend. Let’s not even get into it. The strength and honest conflict in the film is really the relationship between the two brothers and the inevitable, depressing conclusion their lives together will lead to. But, wait. Don’t settle into that just yet, because there’s an over-the-top, high-octane climax headed inexplicably and irreversibly toward you. And remember the whole SciFi nonsense they threw at us in the trailer? Well, it finally finds its resolution in the last five minutes of the film—a plot twist that is so mismatched with the tone of the film leading up to it, it truly feels like a whole other movie just came knocking on the door because it was lost. Dude, all we wanted was beans and rice.